SMILE PANDA Tours is a brainchild of years of traveling experience, exploration to remote villages, adventure trips in the Himalayas, and most of all an initiative towards responsible tourism. The beautiful Sikkim, Darjeeling, Dooars & Bhutan region of the Himalayas are few of such places on Earth where one can experience exotic landscapes of mountains as well as its rural village culture. This region offers great adventure activities also peaceful retreats to its visitors. Responsible tourism doesn’t mean only Eco friendly traveling. It’s an invisible fabric that connects each and every tourism aspect to create a uniform system that supports every element in it. SMILE PANDA Tours is working towards creating this system in Sikkim, Darjeeling, Dooars & Bhutan region and bring smile to everyone associated with it. In a brief, SMILE PANDA Tours is a local for-profit social enterprise from Sikkim, Darjeeling, Dooars & Bhutan region which is trying to reach globally towards the travel enthusiasts and tell them the beauty and untold stories of these Himalayan regions. 1. Village tourism: This is the nucleus of this sustainable tourism system. Picturesque villages of these regions are not only full of natural beauty, one can experience true rural mountain culture in these villages. Our addition to this tourism is traditional Homestay accommodation where tourists not just come and stay with the locals, they can interact with organic farming, learn cooking local cuisines, go for day hike/ multi days trekking, village walk or Monastery walk. In some of our homestays, we have mountain bikes so they can explore the region on wheels. In most of the homestays, we have introduced some unique feature like meditation zone, reading zone, etc. Visitors who are fond of local history or folklore, we have another feature like “Storytelling” where one can hear this region’s very own reserve of local myths and stories from the host of the family. The simple but comfortable accommodation, clean toilets, freshly cooked local dishes are some “must have” qualities we are providing in every Homestays. Keeping the original looks intact we have decorated these Homestays with local traditional stuff and handmade products purchased from local women run society. The good thing is that we have these homestays in almost every popular and offbeat villages of Sikkim, Darjeeling, Dooars & Bhutan. Families who want to stay in a cosy way or backpackers who are in shoestring budget, we have Homestays for everyone. We hope these unique Homestays will knot the bond between tourists who are in need of cultural experience and the lovely villagers of this region. 2. Adventure Tourism: Multi days trekking, One day hike, Mountain Biking, Birdwatching, Paragliding – SMILE PANDA Tours is organizing various adventure activities in this region. The guides, leaders and pilots are not only qualified locals but also well recognized by the various organizations of this region. Our support staffs are also local. The idea is to promote various adventure trails of this region globally and create an alternative job opportunity in the rural areas. 3. Leisure tourism: For the visitors who want to spend their vacation staying in hotels or resort and travel like a conventional tourist, we are here to take care of all the arrangements like a local friend. As our goal is to create a sustainable tourism system, we aware that 72 percent of tourism’s CO2 emissions come from transportation, 24 percent from accommodations, and 4 percent from local activities. To make this tourism more Eco friendly we have come up with a unique strategy. With every such trip we donate books, sports goods or plant tree to a new school/orphanage in this area. This is a silent mission we are doing without any advertisement and making our lovely guests as a contributor to this change. 4. SMILE PANDA Happiness: Our special feature is SMILE PANDA Happiness. An initiative towards pollution free environment and supporting women run small societies from these places to empower them. We are writing stories, blogs, shooting pictures or small videos to tell their stories worldwide. We are locals: At SMILE PANDA Tours you don’t have to worry about your travel arrangements because you always know that you are traveling with the locals who not only know these region very well but are the true travel specialists of this region. Experienced: Our explorers and guides know this region for many years. We are not selling deals, instead It’s the years of traveling experience we are sharing here. One stop solution: In a world of online booking getting a hotels/resorts or travel packages are just a click away. But sometimes so many options make you confuse. Well not anymore! Yes this is the area where we come up with our signature identity. Our travel help desk service is exclusively there for you to plan and fix your holidays which are suitably customized to meet your needs. Whether it’s a short trip or a long vacation, small or big group – It’s a one stop solution for your vacation. Pre-travel consultation: Your travel dates are coming…. still confused about the weather or what you need for your journey? Well, here we provide you pre-travel consultancy service. Please let us know your queries – we are there to help you with a smile! Responsible traveling: Here at SMILE PANDA Tours we are focusing on responsible traveling. We are well aware about the bad effect of mass tourism and committed to carry out our duty towards the mother nature, silently. After all it’s all about a Smiling Earth where everyone can live happily! Budget friendly: Not only giving you high-quality services but we also care about the budget. Our tour packages are tailor-made and can be customized on demand. Happiness: It’s not just a trip with us. It’s a journey of happiness where we are focusing towards “Happy guest and happy locals” by bringing happiness through tourism in the rural areas. Registered: We are a registered travel agency under West Bengal government, India. Why waiting then? Be a part of this smile and experience the fun of traveling with Smile Panda Tours! SMILE PANDA Tours name comes with three different words and each word resonates with two meanings- our client policy and our local responsibility. Smile: Using local resources and employing local people we create a happy ambiance for the tourists, which brings smile on their faces. Creating happiness for our tourists always brings satisfaction to our ever supporting team. We strongly believe in the idea of “Atithi Devo Bhava” that is “The guest is equivalent to God”. Therefore, with a happy guest we also find our happiness. Panda: Dense forest of the eastern Himalayas is home to the beautiful Red Panda. It is the region where we operate. This Panda represents our local connection to this region so that our guests know they are traveling with the locals. However, the population of this lovely animal is decreasing due to habitat loss and poaching. It has been classified as ENDANGERED by the IUCN. We hope our campaign through SMILE PANDA will raise awareness amongst people. Tours: Tours apart, the responsibility towards environmental, social and economic welfare of the region makes us distinct and you can also be a part of this uniqueness. With SMILE PANDA, back at home you won’t reach out to the hollowness of your travel memories without a friend. At the end you will be happy to have a smiling Panda as a friend back here. Back at home, you shall not only cherish the memories but also miss a new friend- ‘SMILE PANDA’! Providing professional services of international standards to the tourists. The beauty of this Himalayan region is still less known to the most of the global tourists. We are promoting this beauty towards global tourists. Making new friends of SMILE PANDA Tours beyond the border. Not just traveling- SMILE PANDA Tours wants to empower the local people of this region through tourism. Green Earth means smiling Earth. At SMILE PANDA Tours, through responsible tourism, we want to be a true friend of endangered Red Panda and it’s friends. We want to make trusted travel/business partners who believe in our tourism philosophy. We strongly believe in the concept of co-operative unity. We are from Darjeeling, Sikkim, Dooars & Bhutan region and we only operate in this area. We provide travel consultancy to the tourists visiting Darjeeling, Sikkim, Dooars and Bhutan region. We design simple to complex travel itineraries suitably customized to meet client’s need. We provide homestay/farmstay accommodation designed for family/friends. We provide homestay accommodation specially designed for backpackers. We arrange guided Trekking, One-day hiking, Camping in this region for the adventure lovers. We also arrange Cycling Tour, Para-gliding, Birdwatching tour, Photography tour, Jungle safari for the adventure enthusiasts. We arrange group tours, educational tours, cultural tours, spiritual tours in this region. We arrange one day sightseeing tour in this region. We also book hotels, arrange vehicles for our clients. 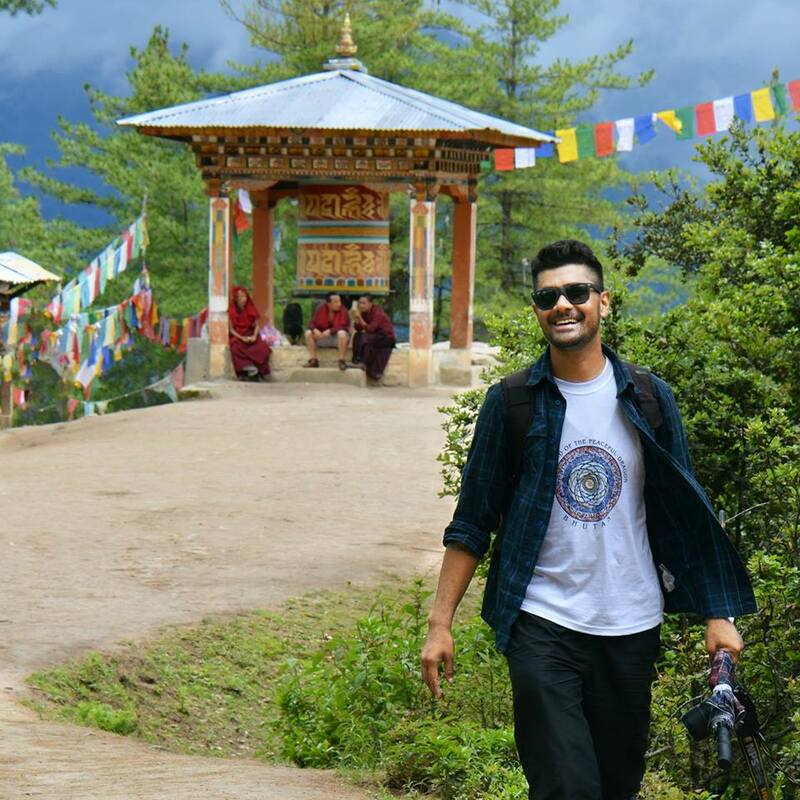 Born and brought up in Coochbehar, a princely state in the foothill of the Himalayas and Dooars, Chayan found his passion for traveling since he was a kid. Being lucky to live in a place which is very close to Darjeeling, Sikkim and Bhutan he had traveled almost every corner of these places. Traveling for the many years in this Himalayan region he has developed an everlasting bond with the mother nature. Owing to this connection, after finishing his bachelors he associated with local Nature conservation organization and started doing volunteering work for the nature and mountain people. He was an active member and took part in the Tiger Census 2013 in Buxa Tiger Reserve, India. Not only conservation activities, he has done his basic mountaineering course (grade A) from JIM & WS which is one of the well recognized mountaineering Institutes in India and carried out many solo and guided treks in Darjeeling & Sikkim region as well as in the state of Jammu & Kashmir and Uttarakhand. He also got a decent experience of successfully leading various groups (National and International) in the Sikkim and Darjeeling Himalayas. He is working towards promoting the natural beauty and cultural diversities of Darjeeling-Sikkim Himalayan region towards domestic & foreign tourists and empowering the rural mountain people through Eco-tours and responsible tourism. He dreams to empower the rural villagers of this region through tourism and make his little contribution to the global effort to make our planet earth a sustainable habitat for the generations to come.